Teacher well-being: Why Dubai is leading the way! Recently I’ve had teacher well-being on my mind…. From a personal point of view, I’m certainly no model of best practice when it comes to work/life balance, this is an area I need to ‘get better’ at and I’ve been reading and learning, particularly about how to prioritise my work better and manage my time more effectively. Workload and organisation-how do we do it? Monday 28th September heralds the return of the KHDA’s (Dubai government’s DEPT for education)‘What Works’ #WWDubai events, of which there are six each academic year. Indeed, ”What Works” has been in Dubai for as long as me! !, having first been established in September 2012. These events provide an opportunity for educators from Dubai’s private sector to come together, sharing ‘best’ practice and ‘next’ practice, also providing guidance and support for one another in advancing Dubai’s education system for the benefit of its students. Previously the #WWDubai events have followed a subject specific focus, following a revamp, the events this academic year will be thematic, beginning with ‘What Works Wellbeing’. I’ve had a sneaky peek at the schedule, and really looking forward to seeing the panel discussion involving Anthony Seldon, former master at Wellington College and playing a bit of ping pong! Our very own KHDA gives precedence to well-being for teachers and indeed their own staff and this is certainly not something new in Dubai’s education sector. Their building is a pleasure to visit and a model in innovation and best practice for customer and staff satisfaction. From the yoga classes to the exercise bikes in meeting rooms, juice bar and staff wearing pedometers . Fundamental to the KHDA’s vision, is to support schools and universities with ‘Creating a high quality education sector focused on happiness and well being’. SPARK (our Teach Meet organisation) has a partnership with the KHDA and regularly supports the ‘What Works’ events. We are holding two ‘mini’ Teach Meets this Monday. I’m going to speak about Twitter, Stephen Covey’s time management matrix and the Pomodoro technique. 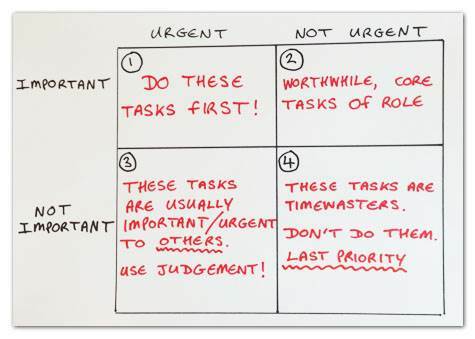 Stephen Covey’s approach to time management is to create time to focus on important things before they become urgent. Sometimes this just means doing things earlier. The real skill is to commit time to processes that enable you to do things more quickly or more easily, or ensure that they get done automatically. Clearly as teachers sometimes ‘events’ may happen during our working day that jump straight into box one, however more considered planning should mean you avoid things sneaking in here. This has helped me to focus on the important tasks, not just those I like doing! 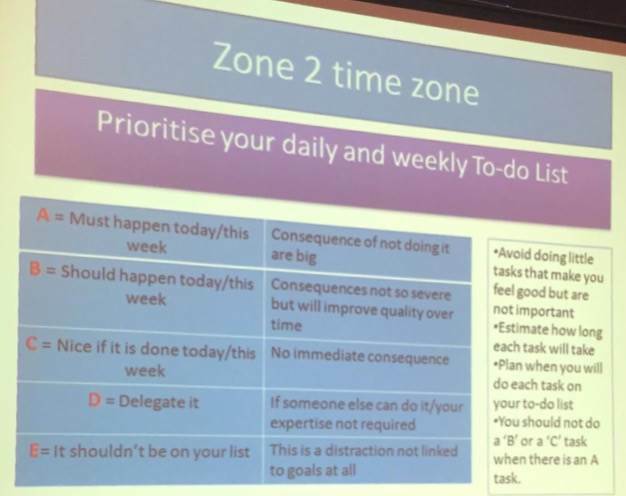 Alternatively, you can use a lettering system to prioritise your tasks, such as the below system, that I picked up when I was at a #SPARKevent in Qatar. 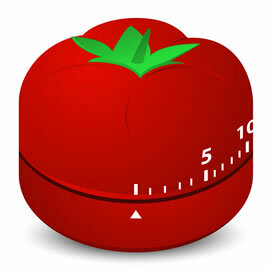 I first read about the Pomodoro teachnique in John Tomsett’s book, ‘Love over fear’. This works on a simple premise: all the possible tasks for a day are written down in a to-do list. Subsequently, each task is worked on in 25 minute intervals until completion. After 25 minutes of continuous working, you are allowed a five minute break. After four such 30-minute sessions, you take a longer break, usually 15 to 30 minutes. The act of initiating a count-down timer and working within a small time frame enforces single-tasking and reduces procrastinating tendencies. Since each interval is a mere 25 minutes long with a 5 minute break in-between intervals, the technique also improves concentration levels and helps to manage stress.